Being a mom is incredible. Poor Ledger gets attacked with kisses all day long by his mom. I'm not sure this kid will ever know how much he's saved me. He's been such a good baby He's sleeping regularly through the night now, but Saturday night he woke up at 4:00 AM. I popped right out of bed when I heard his little cry, almost eager to see him. I was honestly so grateful I had a baby to tend to that night. He immediately fell back asleep after he finished eating and I sat and rocked him for a long time - loving ever minute of it. I can honestly say I'm a better mom because of Preslee. I'm more patient. I'm not perfect, but I'm more patient. I know I appreciate motherhood so much more. Last summer I would have never thought I would love hearing a baby cry in the backseat of my car or I would love to change diapers. I just never imagined I would ever love being a mom so much. Don't get me wrong, I loved it all with Preslee, but I guess she's just taught me to love it at a different level. All the while I have hope that a dear friend of mine can experience motherhood again too. I've blogged about the Webster's before, but I can't help but do it again. Kendra has helped me throughout the past year. She's constantly texting and e-mailing me. She always seems to know what will hit me hard and leave me struggling. She understands because she too lost her daughter Makenzie. Things have been pretty tough for the Webster family lately. Kendra recently lost another baby, she was 14 weeks along. 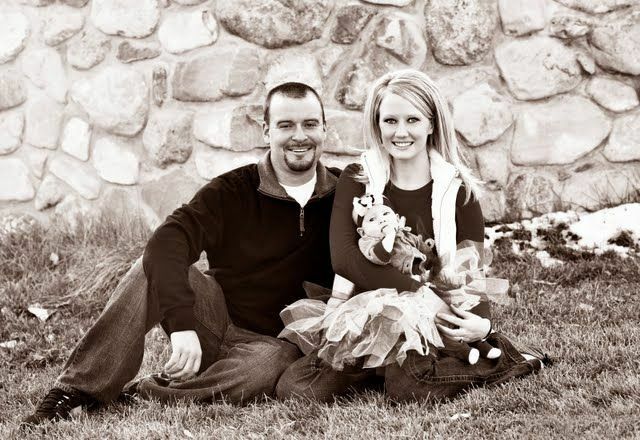 Kendra and her husband Ryan recently received the news that they are both carriers of the disease that took Makenzie's life. Read more about it here. They've decided that adoption is the route they need to go. In hopes to raise money for adoption they are creating a cook book. How fun will it be to have a cookbook with awesome recipes from all over the country? Maybe even from all over the world? If you want to help a family in need, a family who is constantly giving and helping others, go and submit one of your favorite recipes. I promise the Webster's deserve it. I'm so glad that you mentioned the Websters again. After your first post about them I have been following their blog. My heart just aches for them at this time. I pray for them that they will once again be able to experience a sweet spirit in their home. I have been following the Websters blog after stumbling across it from yours. My heart aches for Kendra...with each & every word she writes. I will submit a recipe for her cookbook in hopes of helping them get a little closer to parenthood, again :) You are sweet for helping your friend out! I'd love to purchase a cook book once it's complete. Please keep us informed on the progress. :) And congrats to you and Pat..he is precious. What a great idea I hadn't thought about telling about Kendra and Ryan on my blog. I think I'll copy your example if that's ok and add a little plug for them on my blog. Maybe we can get them some more recipes. Thank you again for being a wonderful example to me. And introducing me to another wonderful family. P.S. Give that baby a kiss from a stranger who loves him. I contributed to the Webster's Cookbook this morning. Both of your blogs are so inspiring, and hope to help in any way we can! My family is created through adoption so I know that every little thing can help. Thanks for remembering them. This breaks my heart into a million pieces. I have been praying for their family since you posted about them before. I will gather my best recipes!! Ashley. I love reading your posts everyday and thank you to You and my sister that found kendra's blog. I went into crystal's office the other day and she was crying and when I asked what wa wrong she said Ashley's blog sent me to a new one and it is killing me, I read this stories and these women are so strong. I so hoped to surpris Crystal and introduce her to Kendra, we live close enough that we should have gone to the fundraiser they had this summer. But we were unable. Both you and Kendra amaze me with your strength and courage for sharing your life with ALL of us!!! We love ou both. Tanner says hi and he and tAYSON CONTINUE TO KEEP LEDGER AND PRES IN THE THEIR DAILY PRAYERS... Miss you tons and tons!!! Ledger is getting so big!!! Just found your blog. I know I am a total stranger, but I wanted to leave a comment and just say you have such a beautiful family :) thanks for sharing your story!